Thousands of mourners including South Africa's president and Archbishop Desmond Tutu have joined Nelson Mandela at the funeral of his son Makgatho. Makgatho Mandela, 54, died of Aids earlier this month, several weeks after being admitted to hospital. Mr Mandela's decision to make public the cause of his death and challenge the taboo surrounding HIV/Aids in Africa was acclaimed by activists. More than five million people are infected with HIV/Aids in South Africa. Mr Mandela's involvement in the fight against Aids has contrasted sharply with the stand of his successor, Thabo Mbeki, who has been accused of not doing enough to tackle Aids. A few hours after his son died on 6 January, Mr Mandela told a news conference that the cause of death was Aids, making him one of the few leaders on the continent to break the silence over the disease. Beneath cloudy skies, thousands gathered in the home village of the 86-year-old former president in Qunu in the south-east for the funeral ceremony, which was held in a huge tent. 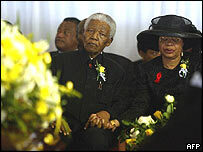 Nelson Mandela and his wife Graca Machel - both wearing red ribbons in support of the campaign against Aids - sat on a podium in front of Makgatho's casket, which was decorated with white and yellow flowers. At the start of the funeral, a prayer was said by Archbishop Desmond Tutu. Makgatho, a lawyer, was buried afterwards in a nearby family graveyard. Nelson Mandela dropped a yellow rose and handful of earth into thegrave. Two men in traditional robes chanted exhortations in the Xhosa language for much of the ceremony, Reuters news agency reported. Thabo Mbeki earlier indicated that his presence at the funeral was a gesture of support for Mr Mandela, rather than a political statement. "Nelson Mandela, a former president, has lost his son. The president has to show support for Madiba at this difficult time," he said, using Mr Mandela's traditional clan nickname. Mr Mandela has three surviving daughters, one from his first marriage and two from his second marriage to Winnie Madikizela-Mandela. His other son, Madiba Thembekile, died in a road crash in 1969. Makgatho's mother, Evelyn - Mandela's first wife - died last year. Makgatho's son Mandla revealed at the funeral that his mother Zondi died of Aids last year, AFP news agency reported. "He [Makgatho] is not the first to be killed by Aids. Our mother died from Aids. In spite of this, we are not used to death, " he said. Previously the family had said Zondi died of pneumonia.